Australia's Cardinal George Pell, Adviser To Pope, Charged With Sexual Assault : The Two-Way Cardinal George Pell, a key adviser to Pope Francis, has been ordered to appear in a Melbourne court next month. He denied the charges and says he'll take a leave of absence to "clear my name." Vatican finance chief Cardinal George Pell of Australia has been charged by police in the state of Victoria with sexual assault. Police in the Australian state of Victoria say they have charged Roman Catholic Cardinal George Pell with "historical sexual offenses." The Archdiocese of Sydney says Pell will return from Vatican City, where he is the top financial adviser to Pope Francis, to fight the charges. Deputy Police Commissioner Shane Patton would not give reporters specifics of the charges against Pell but said there are "multiple complainants." He said the cardinal has been ordered to appear in court in Melbourne on July 18 for a hearing. Patton gave no further details. 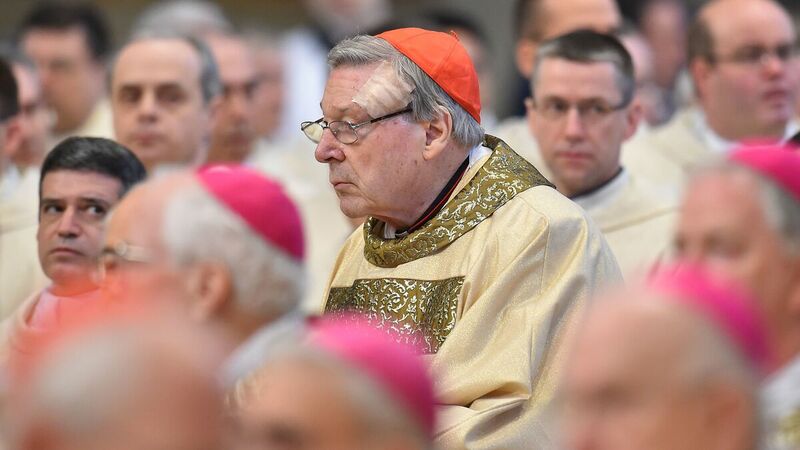 At the Vatican Thursday, Pell told reporters that Pope Francis granted him a leave of absence from his post to travel to Australia to "clear my name." He said he was the victim of "relentless character assassination." "I'm innocent of these charges," he said, "they are false. The whole idea of sexual abuse is abhorrent to me." He's the most senior Vatican official to ever be charged with sexual abuse, Reuters reports. "A year ago, the police commissioner in Victoria disclosed that authorities had been investigating for more than a year accusations that Cardinal Pell had exposed himself to three boys at a beach lifesaving club in the mid-1980s. They also have been investigating allegations from two students who say Cardinal Pell molested them at a swimming pool in the late 1970s, when he was a young priest. Others have accused him of inappropriate behavior with choirboys in the 1990s when he was archbishop." A royal commission has been conducting a wide-ranging investigation of claims of sexual abuse in Catholic institutions in Australia. The commission has issued interim findings that 7 percent of Catholic priests in Australia between 1950 and 2010 allegedly sexually abused children. As we reported earlier this year, a church official apologized, saying abuse is "indefensible" and the church is "deeply ashamed." The commission's lawyer says the group has referred hundreds of cases to police. Pell was appointed to the most senior post in Australia's Catholic Church, the archbishop of Sydney, in 2001.